This road through the heart of the Kimberleys is flavour of the month for east coast 4WD expeditioners looking for adventure. Once a 4WD track where if fewer than half your dozen bottles of beer had blown their tops it was a good trip. Now it’s just another unsealed highway with 50+ 4WDs a day on their Dry Season tour. But great remote country to ride a bike across, particularly from Pentecost River to Mt Barnett roadhouse. Kununurra to Derby, Western Australia via Wyndham. Officially it’s shorter than this but avoiding the main highway on the Kununurra to Pentecost River route via Parry Creek Road, Wyndham, and the Karunjie Track goes through some great less travelled territory and avoids the expensive El Questro stuff. about 930km with the side trips to the various gorges. Most of the western 125km is sealed, or great unsealed, road. The detailed Hema Kimberley map has annotations about the sights along the way as well. 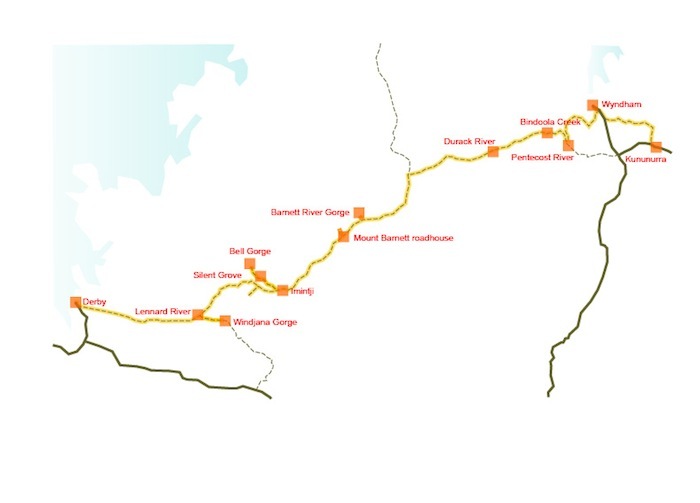 allow 16 days, or so, riding with a couple of extra days off at the pleasant Bindoola Creek waterhole (keep an eye out for an unmarked track at the appropriate map point) and Silent Grove campsite (to have a day at the Bell Gorge swimming hole). Of course you can do it quicker if you prefer speed to just experiencing all the waterholes along the way. May to September inclusive. The Wet Season floods and heat make it sensible to avoid thinking about for the rest of the year. Depending on the wet season the Gibb River road is officially opened some time between mid April and mid May. Main Roads Western Australia only opens the road after the rivers at the crossings have dropped low enough so vehicles can get through safely. Gibb River Road in orange. Permanent water points shown. It’s generally not possible to easily cross the (700mm deep) Ord River at Ivanhoe Crossing so take the highway a few kilometres until the Parry Creek Road turnoff. The back road from Kununurra to Wyndham on Parry Creek Road via is gravelly at the start but gets easier as you go. There’s a few gates to open and close. The direct route from Wyndham to the Pentecost River Crossing via the King Valley, Boab Prison Tree and the 50km Karunji Track has little information at the information desk at the Wyndham service station. It’s possible to report that it is mostly a fantastic little used track for the touring cyclist but a word of caution that the track eventually deteriorates and the last 15km is harder work due to short bulldust sections. The last 300m turns into deep sand and a good sweat is inevitable as you burst out onto the Gibb River Road. The Pentecost Crossing sounds ominous but it’s just above the tidal affected area and is not a huge issue during the Dry Season. There are plenty of 4WDers visiting both heading down the GRR and day trippers from Kununurra. Once through the knee deep water the road itself is quite variable. There’s about equal amounts that are gravelly and jarring, or soft and therefore hard work, or great, just like cruising on a clay tennis court. A huge amount of building up the road has been done in the last ten years to avoid the worst of the sandy or soft stretches. No longer a rugged 4WD track most travellers are surprised to find it’s just another unsealed highway. Fat tyres, low pressure, you can ride the lot, even if some of it is on the wrong side of the road. Town supply water is available at Kununurra, Wyndham and Derby. There’s acceptable bore water at Mount Barnett roadhouse, the Imitji store and Silent Spring camp ground. Otherwise there’s plenty of reliable waterholes holding water from each Wet Season along the eastern section of the road. As you move west the water points are more widely spaced and you have to carry more. There’s a few station bores to the west of the Windjana turnoff, look out for the windmills. A water filter is recommended unless you aim at topping up the supplies from the motorised brigade, or you don’t have one. Kununurra has a small Coles, (open 6 days) and IGA supermarket, (open 7 days until 7pm). Wyndham has an IGA supermarket (open 7 days until 7pm). You can pick up a few treats and basic groceries, supplies are patchy depending on how long at Mount Barnett roadhouse and the aboriginal community store at Imintji. A Woolworths (open 6 days) and an IGA supermarket (open 7 days until 7pm) in Derby service the 4000 population. Caravan parks at Wyndham, $11pp and Derby $10pp. Silent Grove in King Leopold Conservation Park, ($9pp a night), and Windjana Gorge, ($11pp a night) camping ground have flushing toilets, hot showers and drinking water. Manning Gorge is $20pp if you like plenty of curious company and paying money to stay in a amenity lacking zone. There are other paid campsites at stations along the way that are more geared to 4WDers. But you can camp just about anywhere, near a waterhole is good. The 5 Rivers Lookout at Wyndham is a short sharp 300m climb for a fantastic view at sunset. There’s a few gorges along the way, Barnett Gorge is a good camping spot but where’s that gorge. Manning Gorge is a paid excursion, if you remember, and worth the detour. Galvan’s Gorge has some aboriginal rock art and the waterhole is good for a dip but watch out for those large water monitors. Bell Gorge is the highlight and worth the excursion, nice walk in and a memorable swimming spot. Lennard Gorge is more dramatic and worth a viewing as well. By the time you get to the busy Windjana Gorge you may feel you have had enough. It’s not exactly the drama of the Katherine Gorge. It’s, obviously, a dirt road so there’s dust when the 4WDs hurtle past. In the peak season, May to August, there can be 200 people at popular campsites. Also has to be the intrusive 4WD tourists who believe they are among the first to traverse this oh so remote country in their air conditioned cocoons and may not believe you have a right to be there. Saltwater crocs are possible at any waterhole, so they say, camp 50m from the water’s edge is the recommendation. These 30 images give a general impression of the road conditions you are likely to encounter on the GRR.